Today I want people to know the story which inspired this entire month of tales about gratitude, "Wali Dad, the Simple-Hearted." For those who love to compare and contrast versions, there are two lovely picture book editions. 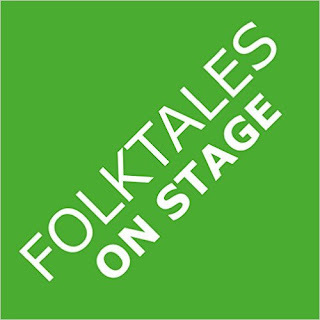 There's also another place for ideas on performing the story at Tell It My Way. But each of those is a retelling. As Aaron Shepard notes: This is a retelling of the “Story of Wali Dâd the Simple-hearted,” found in Andrew Lang’s Brown Fairy Book (1904). 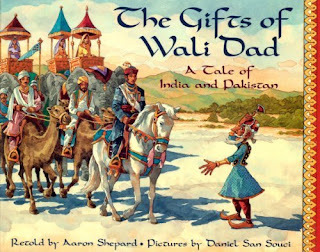 The tale was given to Lang by a Major Campbell—a British army officer stationed in India’s Punjab—who heard it from “an Indian.” Since the Punjab was later split between India and Pakistan, I have thought it best to attribute the tale to both countries. The dominant influences of the story are Islamic and Zoroastrian rather than Hindu. I want you to know the original as collected by Andrew Lang. I am, however, scanning that original illustration because the Peris -- and Wali Dad -- should be seen -- along with Aaron's explanation of them. His own research tells us "Peris are an import from Persian mythology. Originally considered evil, their image changed gradually to benevolent beings akin to fairies or angels. It is said they feed only on the odor of perfume." Mmmm, how sweet an idea! 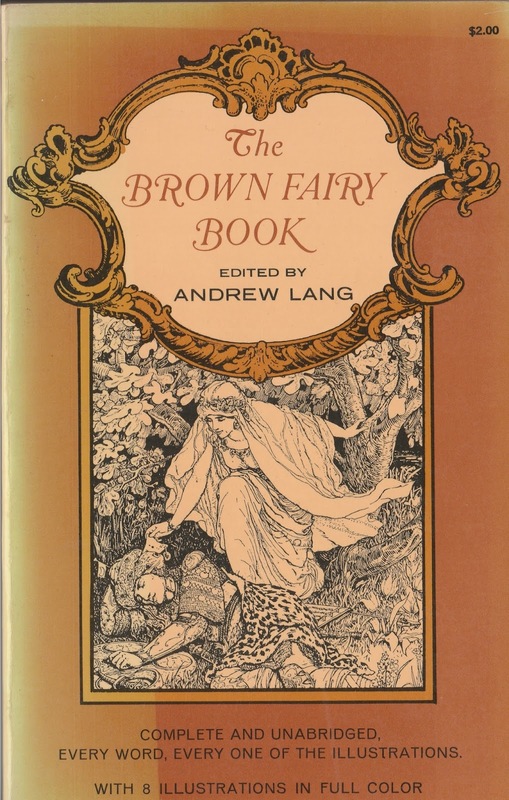 Both Aaron Shepard and Lit2Go remind you the story comes from Lang's The Brown Fairy Book. You may notice that's a Dover Publications book cover. At one time they published the entire "Rainbow series" by Lang. Unfortunately they now only offer some of the series and the Brown Fairy Book is not one of them. 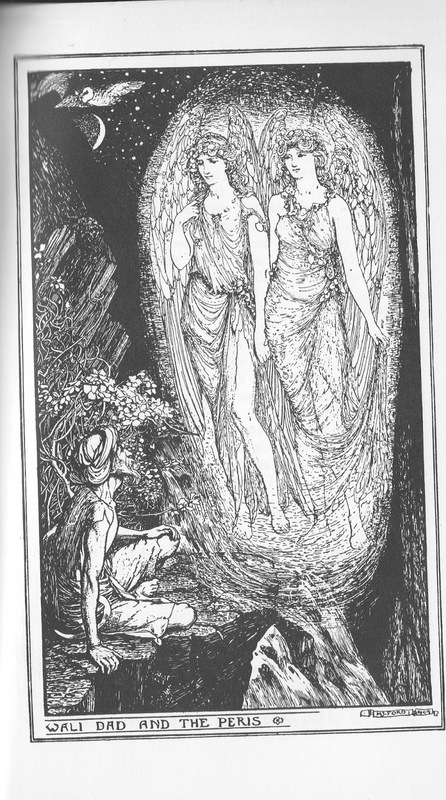 For affordable hard copies of what they still provide, go to Dover Publications books by Andrew Lang where the good news is they have even more than just the Rainbow series, as they include such books as Lang's Arabian Nights Entertainments. For an online copy of the whole book, thank heavens for Project Gutenberg, who have some other unusual Lang books as well as, so far, ten of the twelve Rainbow -- as of this writing omitting Orange and Lilac. 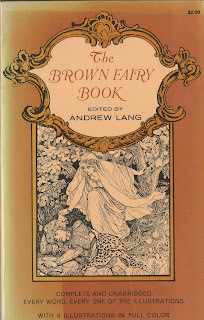 For a full list of contents, go to Wikipedia's article on Andrew Lang's Fairy Books to find all the stories in these wonderful books which Lang produced between 1889 and 1910. Now for a bit of a personal suggestion on the telling of this story. The story is fairly long, 3,522 words according to Lit2Go or 10 pages of text + illustration in my copy. Dear Wali manages quite a few gifts on his limited budget. (Just shows how much good we all can do!) That Lit2Go activity about each action's cause and effect is a great tool to have near the teller, or at least keep a list of the gifts. Here are a few interesting additional tidbits I discovered. Wikipedia's article on the meaning of the Arabic word "Wali" tells us the word means "custodian", "protector", "helper", etc., but the most common meaning of the word is that of a Muslim saint or holy person. 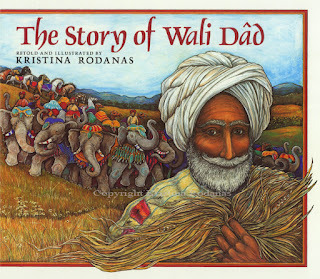 Wali Dad certainly fits that in the story. Rudyard Kipling uses the name in his short story, "On the City Wall." There actually is a city in Pakistan called Wali Dad. Here in the U.S. it's the start of our winter, but there Weather.com gives this week's forecast as in the 80s and sunny. Here in the United States, whether sunny or not, the fourth Thursday in November has been declared Thanksgiving Day. Recently people seem to want to call it Turkey Day, after the most common dish eaten and now I've seen one commercial trying to call it Thanks Getting Day! I absolutely never plan to shop on Thanksgiving Day. It's a day to celebrate with your family and think about the many reasons you may have for gratitude. I hope this month's stories have given you ways to enjoy and tell about your gratitude. As today's story shows, this isn't limited by religion, and Keeping the Public in Public Domain isn't limited in time, we all have such reasons if we only look.